Prof Nick Barton and DPhil Abigail Desmond update us on the latest season of fieldwork conducted at the site of Taforalt, Morocco. These last few years have proved to be an exciting time for archaeologists working in the early prehistory of North Africa. 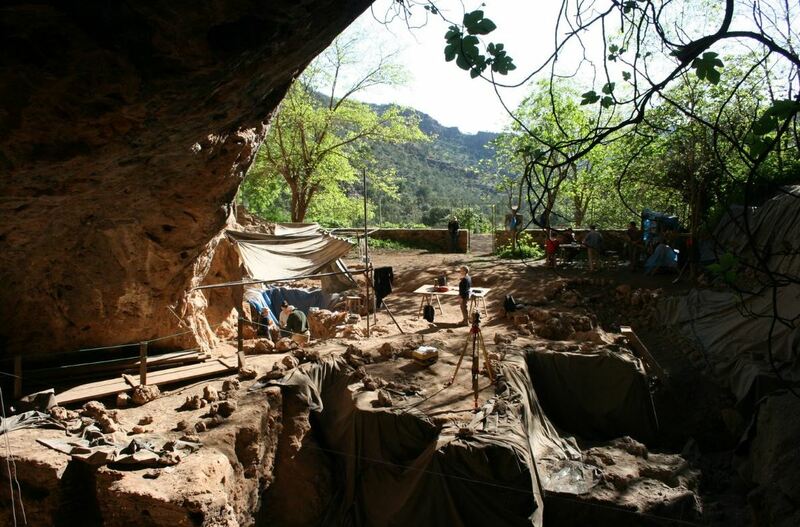 In addition to the recent discovery of the earliest member of our human species (at Jebel Irhoud, Morocco), the Oxford team announced the oldest African nuclear DNA sequence recovered to-date, from the site of Taforalt, Morocco. This fascinating work (“Pleistocene North African genomes link Near Eastern and sub-Saharan African human populations”, van de Loosdrecht et al. 2018, Science) has shown that Later Stone Age peoples (known as the Iberomaurusians) had genetic similarities to both Western African and Near Eastern groups, indicating a great deal of mobility among hunter-gatherer groups much earlier than previously recognized, which included trans-Saharan travel. Led by Prof. Nick Barton in collaboration with colleagues at L'Institut National des Sciences de l'Archéologie et du Patrimoine (I.N.S.A.P.) and The Natural History Museum, London, excavations continued at Taforalt in April 2018. During this year’s field season, our team excavated hitherto undisturbed contexts dating to the Later Stone Age, potentially including the earliest evidence for an Iberomaurusian presence within the cave around 23,000 years ago. Excavations within the burial alcove (from which the oldest African human DNA sequence was recovered) continued, and artefactual analyses of this culture are ongoing. Abigail's forthcoming publication on bone tools recovered from this same burial alcove has shown how new biomolecular identification techniques can help us better understand Palaeolithic technology, and what these tools can tell us about the people that created them (“ZooMS Identification of Bone Tools from the North African Later Stone Age”, Desmond et al. 2018, Journal of Archaeological Science). We also continued our exploration of the relationship between older industries (known as Middle Stone Age) and the Iberomaurusian. To this end, we recovered a number of tools which represent a completely new industry at Taforalt; this newly discovered industry with adzes that occurs just at the stratigraphic transition between the Middle Stone Age and Later Stone Age/Iberomaurusian, and yet resembles neither. Its lack of resemblance to anything we’ve recovered on-site so far makes it intriguing, particularly on the heels of our latest DNA discoveries. Did the makers of these tools travel from afar to settle at Taforalt? Did the people responsible for this new industry contribute culturally or genetically to the Iberomaurusians that followed? Time (and continued excavation and analyses) will tell! Furthermore, a number of new Nassarius shell ornaments were recovered from earlier MSA contexts, enlarging the sample-size for some of the earliest symbolic behaviour found anywhere in the world (“82,000-year-old shell beads from North Africa and implications for the origins of modern human behavior”, Bouzouggar et al. 2007, PNAS). Taforalt truly seems to be the site that keeps on giving, and we at Oxford are pleased to be engaged in international collaborative research with our partners, in service to understanding human stories in deep time. 1 Abigail Desmond suited up for excavation at the back of the cave. 2 A view of the cave under excavation with the new area of the Middle Stone Age/Later Stone Age transition located under the canopy.